I'm not really a pie person. But, there are a few times a year where it's practically required to make and/or eat pie. I grew up eating, and actually loving, lemon meringue pie. I like a good pumpkin pie as well. Come to think of it, maybe it's just the crust I can't get on board with. Yes, crusts are beautiful and buttery and flaky, but to me, it's just plain, boring and almost tasteless. I often just eat the filling right out of the shell. Anyway, over the years, I've embraced pie more and more and have found my favorites that I can make over and over and genuinely enjoy. Take this blackberry pie for example. So good! And this egg nog pie, just in time for the holidays. This pie today takes the cake! It's everything you want in a dessert...chocolate, peanut butter, smooth and crunchy, salty and sweet. The whole shebang! Combine all ingredients for crust. Press firmly into pie pan and bake at 350 degrees F for 10 minutes. Cool completely. In a double boiler over medium low heat, melt chocolate, milk and marshmallows. Whisk until smooth. Remove from heat and cool. Whip 1 cup of heavy cream until stiff and fold into cooled chocolate mixture. Fold in vanilla. Pour into cooled crust and chill. In a mixing bowl, whip remaining cup of heavy cream until stiff. In a separate bowl, whisk about 1/3 of the whipped cream into the peanut butter, powdered sugar and vanilla. Gently fold in the rest of the whipped cream. Spread the whipped topping on top of the pie and chill until ready to serve. Garnish with chocolate curls and crushed pretzels, if desired. Ahhhhh!! This has become one of my favorite things to cook over the last few months. I never used to cook much with pork, except pulled pork, and I was looking for something different and easy. Well, this was a sure winner. Super quick and easy and I always had everything on hand. I actually started making these with pork chops instead of a tenderloin, which I equally love and makes for an even quicker meal. But, either way, this is staying in the dinner rotation for a while. Hope my fam doesn't get sick of it! 1 pork tenderloin, about 2 lbs. Heat a drizzle of olive oil in a cast iron skillet over medium-high heat. Salt and pepper the tenderloin and add it to the pan; brown on all sides. Remove to a plate and add butter, brown sugar and rosemary. Once butter is melted, stir to combine and add the tenderloin back in. Spoon the sauce over the meat and put it in the oven for about 8 minutes, or until the internal temperature reaches 165 degrees F. You can also take it out half way and continue spooning the sauce on top. Once cooked, remove from oven and allow to rest. Serve warm. I LOVE Sundays. I love that I get to sleep in (sort of). I love that I can make pancakes or scones or muffins for breakfast, not something I can do during the week, and I love hanging out in my pajamas! I also LOVE Sunday dinner. Gathering around the table with your loved ones and sharing a good meal has got to be just about one of the best things on earth. The last time we got together I got to make a big pot of this warm, hearty soup. It was the perfect remedy for a cold and blustery day. In a Dutch Oven, heat 1 tablespoon of olive oil over medium-high heat until rippling. Add the onion, carrots and celery. Reduce heat to medium and saute until onions are soft and translucent. Remove to a bowl and set aside. Add about a half of a tablespoon of butter and another small drizzle of olive oil to the pan. Add the mushrooms and saute until soft. Remove and set aside as well. Add remaining tablespoon of olive oil and beef cubes and saute until browned on each side. Add veggies back in, the garlic and fresh thyme. Saute about a minute, until fragrant. Add tomato paste and red wine. Increase heat to high and bring to a boil to scrape up any bits on the bottom of the pan. Add broth and barley and bring to a boil. Reduce heat to simmer and cook about 45 minutes. I think lemon is one of those quintessential flavors of spring. Maybe it's one of those flavors that you either love or hate. But we just love it here! Especially when it comes in the form of dessert. I decided to make this Lemon Cream Tart for Easter this year and it was delicious. The tart shell is salty and buttery, crispy and slightly sweet and made with roasted macadamia nuts (which I also love). 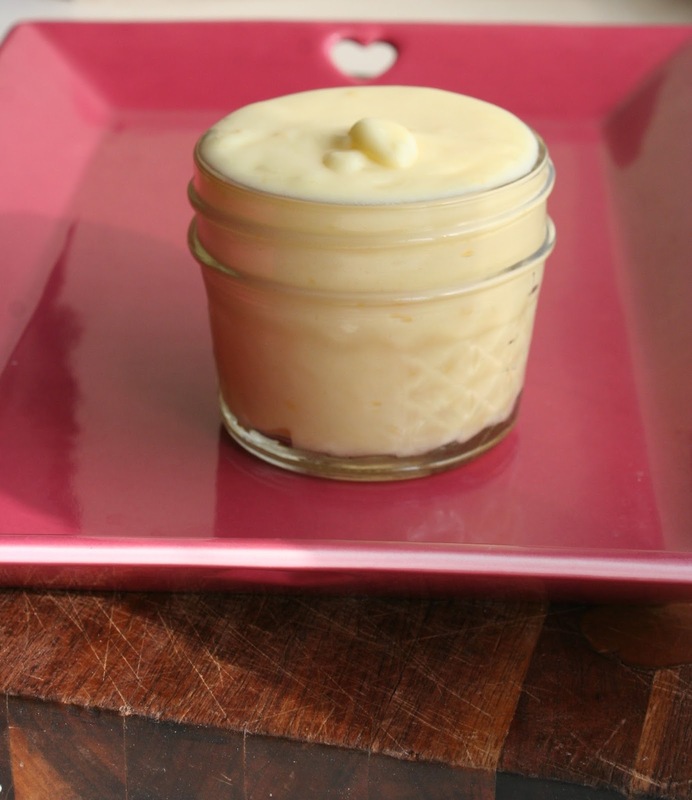 The filling is a simple lemon curd mixed with fresh whipped cream. What could be better? The combination is heavenly and it would make a lovely addition to any spring or summer menu. Preheat oven to 375 degrees F. Put all the ingredients for the crust into a food processor fitted with a blade attachment. Blitz until it resembles a coarse meal. Press into a 9-inch tart pan and bake for 11-13 minutes. Remove from oven and allow to cool completely. For the lemon curd, add all ingredients into a medium saucepan. Cook over medium heat until butter is melted, stirring frequently. Increase heat to medium-high and cook until thickened, whisking constantly; about 8-10 minutes. Pour into a bowl and cover with plastic wrap, pressing it down on top of the curd to prevent film from forming. Chill in refrigerator. When the curd and tart shell are cooled. Make the whipped cream. Pour cold cream into a mixing bowl. Whisk on high until stiff peaks form. Mix in the powdered sugar and vanilla. To assemble the tart, mix 1 cup of the whipped cream with the chilled lemon curd. Pour into tart shell and freeze 2 hours before serving. Remove from freezer 5-10 minutes before serving and add fresh blueberries for garnish. Keep leftovers covered in the freezer. While some may think it's super restrictive, which it kind of is, that totally works for me. You see I just finished reading Gretchen Rubin's, Better Than Before, which is mainly about habits. There are basically two kinds of people when it comes to habits; moderators- those who are good with having just a little, which keeps them from going overboard, and abstainers-those who, if they have just a little, it will push them overboard, leading them to overindulge. I am an abstainer, that is why this works for me. I also know it's not forever. It's meant to be a reset diet, to help target food sensitivities, heal the gut and break free from a bad relationship with food. Although I am done with my first round, I'll definitely be back for more. I don't think my body is done yet, but I do need to take a break for a while. Hopefully in the meantime I can keep up most of the habits, while still being flexible. So, are you wondering what the heck this has to do with sweet potatoes and guac? Well this is probably one of my most favorite things I made during Whole30. The fact that fat was not the enemy and I could eat LOTS of avocado totally made me happy! This guac is out of this world. And, what's not to like about sweet potatoes? Granted, they're not crispy like regular fries. In fact they're kind of floppy and I actually ate them with a fork. But that may be because I can't cut fries worth a darn, HA! So, Whole30-ers or not, there's nothing not to love about this combo. Preheat oven to 450 degrees F. Line a baking sheet with silicone baking mat, if desired. In a mixing bowl, toss sweet potato wedges with a couple drizzles of olive oil, a few dashes each of salt and smoked paprika, until well-coated. Lay out evenly on baking sheet and bake about 30 minutes, or until lightly browned. About halfway through, take them out, loosen them with a spatula and give them a little shake. While the sweet potatoes are baking, mash the avocados and place them in a serving bowl. Add in the rest of the ingredients and stir until combined. Taste for seasoning and adjust if necessary. Once sweet potatoes are cooked, allow to cool slightly. Serve warm with guacamole. So, how many of you have an instant pot and love it? I've been dying to get one since Christmas and we finally did last week! Thank you Amazon prime for 2-day delivery! We've used it about 4 or 5 times since then and just love it. I seriously can't believe how fast it cooks things. Like, if you cut a roast into pieces....10 minutes. 10 minutes!!! Gone were the days of oops, forgot to turn on the oven or crockpot 6 hours ago, I guess we're having cereal for dinner....again, ha! Anyway, I'm so happy with how this roast turned out. Greek food and flavors are some of my most favorite to prepare and eat. While the meat doesn't taste quite like your typical gyro meat with ground lamb, it's still very tender and well-seasoned. You can serve the meat with some veggies over rice or potatoes but I love to serve it gyro-style. Use either some flatbreads or pitas, spread the meat down the middle and add toppings, such as tzatziki sauce, cucumbers, tomatoes, extra onions, feta cheese or kalamata olives. Trim any excess fat off the roast and cut into 1-inch thick slices. Mix seasonings together in a small bowl. Add meat to a bowl, drizzle with olive oil then add seasonings and toss to coat. If using the Instant Pot/pressure cooker, turn on sauté mode. Drizzle a little olive oil in the bottom and add the onions. Sauté 4-5 minutes until tender, stirring frequently. Add garlic another 30 seconds, careful not to burn it. Add the meat and sun-dried tomatoes and pour in the broth. Give it a little stir then pop the lid on. Cook on high pressure for 30 minutes. Let rest for 10 minutes then release steam and open the lid. Remove meat to a plate or cutting board. Slice or shred the meat and put it in a serving dish. Strain the onions and tomatoes from the liquid and add them back to the meat. Add additional broth back to the meat as well, taste for seasoning and adjust, if necessary. *To cook in a slow cooker, trim fat off roast and leave it whole. Place in slow cooker, rub with seasonings then add the onions, garlic, tomatoes and broth. Cook on low 6-8 hours or until comes apart easily. Twice I have made this and twice we've ooohhhhd and aaaahhhd over it so I thought it was time to throw it up here. The funny thing about gnocchi is it was probably my least favorite food while living in Uruguay as an LDS missionary. When I came home, I was glad to never eat it again. So when I told my husband, the first time I made this, what we were eating, he responded that gnocchi was the least likely thing he thought I'd ever make! Well, thanks to Pinterest and all the other lovely food bloggers I kept seeing these amazing pictures and recipes for gnocchi. I figured it was time to try it again. I'm so happy this was the first thing I made. 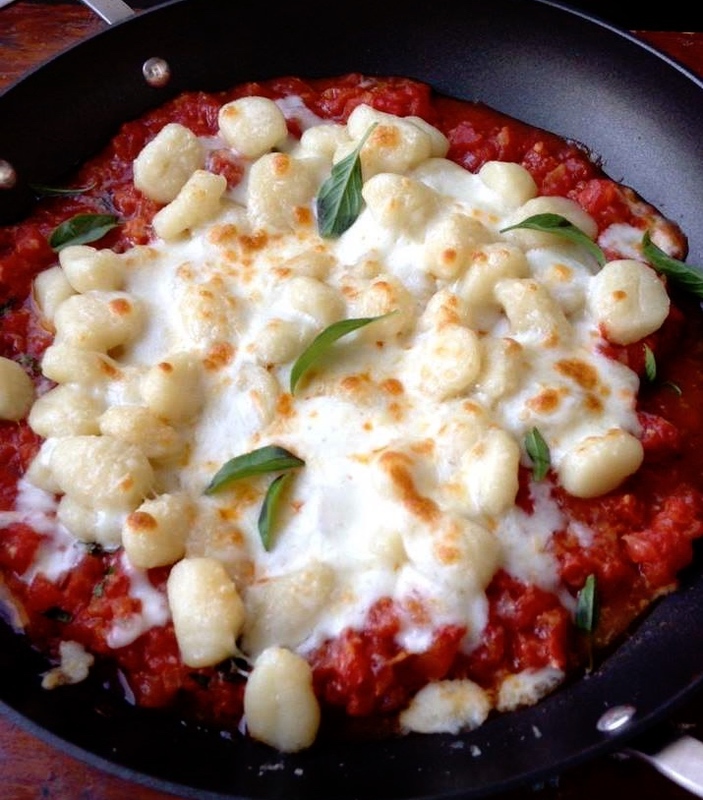 The sauce is pretty much everything because the gnocchi doesn't have much flavor, and it's so incredibly flavorful while being super simple at the same time. Although the gnocchi itself doesn't have much flavor, it lends great texture; it's soft and smooth, almost like biting into a marshmallow. The cheese melted over the top, with those little bits of crispy brown parts just puts it over the top! Heat olive oil in a saucepan over medium high heat. Add shallot and cook 2-3 minutes, then garlic for another minute. Add tomatoes and half the basil and reduce to a simmer. Depending on how juicy your tomatoes are, simmer 20-30 minutes, stirring occasionally. Mash the tomatoes as you stir, either by using a potato masher the back of a spatula. Add a pinch of sugar, salt and pepper and check for seasoning. Add salt as necessary. Remove from heat and stir in the remaining basil. Meanwhile, bring a pot of water to a boil. Boil gnocchi as directed. Drain and add to the pan of sauce. Stir to coat then top with mozzarella. Place under the broiler until it starts to brown, about 2-3 minutes. Remove from oven, serve immediately. My favorite thing about the weekends is sleeping in, going on long walks and making fresh cream scones! They have become a habit around here and we just never get tired of them. Peaches are in season right now and we just got a whole bunch from my parents' trees. I can most of them for food storage but always leave some for fresh eating and, of course, making yummy treats with. If you have not tried scones before or have tried them and have not been impressed, you must try them again! 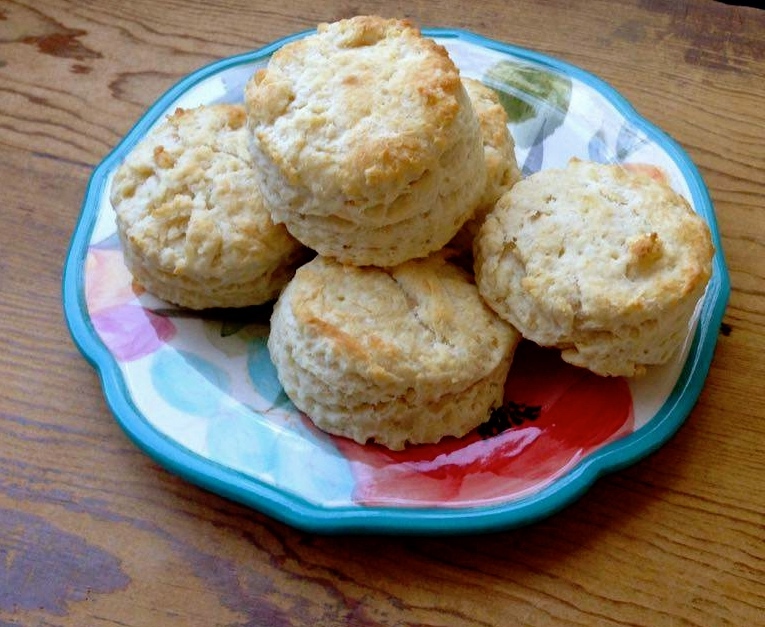 I have a ton of scone recipes on the blog and they are all pretty fabulous. I use a cream scone base recipe and they turn out so light and flaky and just perfect if you ask me. In May I made this cake for Mother's Day for me, my mom and my sister. It was the first time I had used lavender in cooking or baking and it was so delicious. Since I still had tons of lavender leftover, plus the fresh peaches, this scone recipe was a no-brainer. Preheat oven to 425 degrees F. Place peaches on a baking sheet and toss with brown sugar and a couple drizzles of olive oil. Bake for 10 minutes, remove from oven and toss again, then put it back in the oven for 10 more minutes. Remove from oven and cool completely. Drain the liquid off the peaches and reserve for the glaze. In a food processor fitted with a blade attachment, add the flour, baking powder, salt and sugar. Pulse a couple times to blend. Add butter and pulse until mixture becomes a coarse meal. Alternately, you could use a pastry blender or two knives to cut the butter in. In a separate mixing bowl, whisk together the heavy cream and vanilla. Add the dry mixture and with a wooden spoon, stir until it just comes together. Turn out onto lightly floured surface and knead gently, only about 4-5 times, Split the dough in half and press each out into about a 6-inch circle. Cut into wedges and place on a baking sheet, lined with a silicone baking mat. If you are not planning on glazing them, brush with additional cream or an egg wash before baking. Bake in preheated oven, 425 degrees, for 12-15 minutes or until lightly golden. To make glaze, whisk together the reserved peach juice and powdered sugar. If it's too thick, add milk or heavy cream until it's thick but syrupy. Spoon glaze onto cooled scones and garnish with additional lavender, if desired. Best eaten fresh the first day. Will keep about 3 days in a vented plastic container. If you've followed my blog for a while you know about my love for all things scones. Cream scones, to be exact. I had never made them until a few years ago, now it's about my most favorite thing to bake on a weekend. They are delish, they are to DIE for. So, it's probably no surprise to find out I love biscuits as well. They are very similar and the method is pretty much the same. Mile high biscuits are wonderful!! They aren't quite a mile high, but they're nice and tall with lots of buttery delicious layers, a little crispy on the outside and soft and chewy on the inside. They're great at breakfast smothered in sausage gravy or as an egg sandwich. They're even great at dinner! But, I think my most favorite way to eat them is with some homemade raspberry jam. A couple things to remember when working with biscuit dough. *Embrace the crumbs- Your dough will be a little dry, as it should. It's not going to be soft and elastic like bread dough, it'll be more craggy-looking. *Less is best- Remember not to over work your dough or it will become too chewy. *When using a biscuit cutter, don't twist it to get the dough out, it will seal off the edges, making it harder for the dough to rise "mile-high." Make sure the cutter is floured and you'll be able to lightly tap the dough out. In a food processor, fitted with a blade attachment, add all ingredients but the egg and buttermilk. Pulse until it looks like a coarse meal. Alternately, you can use a pastry blender or two knives to cut in the butter and shortening. If you use your fingers, work QUICKLY as to not melt the butter. In a large mixing bowl add the egg and buttermilk and whisk. Add the flour mixture and stir with a wooden spoon until mostly combined. Turn out onto a lightly floured surface and knead by hand just until dough comes together; about 10 seconds. Pat dough out into a large round, about 1-1/2 inches thick. Using the biscuit cutter of your choice, cut as many biscuits as you can. Barely press scraps together and cut the rest of the biscuits out. Place biscuits on a cookie sheet and bake 12-15 minutes or until lightly golden brown. Biscuits are best the first day but can be stored 2-3 days in a vented container. They will get soft over time, so if you're eating them on the second or third day, slice them in half and throw them under the broiler for a minute or two on each side to crisp them up a bit again. Two of my favorite "take out" foods I love (and prefer) to make at home are pizza and hamburgers. Pizza, obvs, because I can put whatever crazy toppings I want, not just pepperoni and cheese. Hamburgers because, hello, PRETZEL BUNS!! No seriously, they are the bomb. I discovered them at Costco last year and now it's the only thing I use for my homemade burgers. Actually I think the taste of a homemade burger far surpasses that of anything you'd get at a fast food joint. And, I'm choosy about my ground beef and like to know where it comes from. I have been using this recipe for years and I love it. It's great to build on. Buuuuut, I wanted to step outside the norm with this one, do chicken and amp up the flavors a bit. The thought of this burger had me drooling and I could not wait to make it. It was seriously delish, maybe not something for a quick weeknight dinner, but definitely something to plan for the weekend! While these burgers are fabulous with the pretzel buns, they are not necessary, you can use any ol' bun you'd like. And the teriyaki sauce I used was thicker like a glaze or dipping sauce. In a bowl, gently mix the ground chicken with the rest of the burger ingredients. Make 6 patties. Refrigerate about 30-60 minutes to help them firm up a bit, they will be very soft. Prepare outdoor grill. Place chicken patties as well as pineapple slices on the grill. Grill chicken 4-7 minutes each side. Grill pineapple 2-4 minutes each side. *NOTE: Grilling the pineapple with the core intact helps it not fall apart while cooking. Once removed and cooled, use a pairing knife to remove the core. Meanwhile, puree pineapple chunks, cream of coconut and sour cream together for the piña colada sauce. Pour into bowl or squeeze bottle for serving. Remove burgers from grill once done cooking; place a slice of cheese on each patty to melt. Turn heat down on grill and place buns, cut side down, to toast up a bit. Just keep an eye on them, it should only take a minute or two. To assemble burgers, spread a spoonful of teriyaki sauce on each half of the bun. Next, spread the piña colada sauce, add a patty, slice of pineapple and bacon and top with the lid. Enjoy every last bite! It's worth it! Up until about 2 years ago, I had almost never made waffles my entire life. Sure, I grew up with a mom that made them often and I enjoyed them. But I always considered myself a pancake connoisseur. I've made LOADS of pancakes I can make just about any kind with my eyes closed, no recipe needed. Waffles, to me, were just not on my radar because there were those little extra steps of separating the eggs, whipping the whites and folding them in the batter. Just not my thing (ok there could be a time and place for it-but not for breakfast). Then it happened. I found LOVE. Waffle Love that is. About two summers ago the Waffle Love food truck started showing up around the corner from where I live and I just HAD to try. I mean I can make a mean breakfast so if they can sell this thing from a truck, it MUST be good. And it was. And I died with my first bite. You see these aren't your typical buttermilk, whip 'em up in the morning waffles. These waffles have yeast and the batter sits out overnight for the flavor to develop (kind of like you would a sourdough starter). And when you cook them in the waffle maker, oohhhhh the smell that fills your house. I just died again. These have become a tradition we do twice a year, in the spring and in the fall. We enjoy these waffles with Nutella, Biscoff cookie butter, whipped cream and fresh fruit-usually berries. Once you try these you will NEVER (maybe almost never) go back again. Combine the yeast and the water in a large mixing bowl and let stand for a few minutes. Stir to make sure the yeast dissolves into the water. Melt the butter over low heat. Combine the butter with the milk, salt, and sugar (if using). Test with your finger to make sure the mixture has cooled to lukewarm, then stir it into the dissolved yeast mixture. Add the flour and stir until a thick, shaggy dough is formed and there is no more visible flour. Cover the bowl with either plastic wrap or a loose fitting lid and let it sit on the counter overnight. The batter will double in bulk as it rises. The next morning, beat the eggs and baking soda into the batter until completely combined. After all the kitchen failures I've had, it's nice to have something work out once in a while. I didn't even know I was going to make this, let alone blog about it. But it was SO good, I couldn't NOT post it. This was my first attempt at cauliflower rice (as far as I can remember, lol!) and I have to say I'm a huge fan. I love that it's just like rice in that it'll take on the flavor of whatever you cook it with; so it's very versatile. I also love that after eating a big bowl of it I don't feel like I just ate a brick because it's all VEG! That's a big score in my book. We love jambalaya in our house so this was right up our alley. The flavors are spot on, just enough spice to give it a good kick but not too much you can't taste anything else. I used Aidells Organic Cajun Style Andouille Smoked Chicken Sausage, which is nitrate free and has no added hormones. But feel free to use any kind of Cajun style sausage you can find. I served the cauliflower rice with Cajun seasoned tilapia and steamed asparagus. It was perfect! Place cauliflower florets in a food processor with a chopping blade and pulse until finely chopped. If necessary, chop in batches. Prepare the rest of the veggies because cooking will go quickly. Heat a drizzle of olive oil in a large skillet over medium high heat. Add onions and sauté until soft and translucent; 5-7 minutes. Add the garlic and peppers and sauté another 3-4 minutes, then add sausage and cook until browned. Add the cauliflower, spices and seasonings and chicken broth and simmer until veggies are tender but not mushy; about 5 minutes. Taste and adjust seasoning as necessary. Serve warm and garnish with fresh parsley. This winter has been the longest, snowiest and coldest winter we've had in a LONG time! I walk around my house with layers of clothes and still freezing. I am really looking forward to spring and wearing less clothes! In the mean time, I've been making lots of soup to keep me warm. My middle daughter started asking me to make broccoli soup a few weeks ago. It kind of caught me off guard because I don't remember her ever actually eating or wanting broccoli soup. I don't know where she got the idea that she liked it. Buuuuut I was gonna take FULL advantage of that. You know when kids even think they might like something, it's so much easier to get them to eat it! I actually made two attempts at broccoli soup. The first one, a pretty simple and classic recipe, bombed! My kids wouldn't touch it. So I decided to tempt fate and try again. Inspired by this Zucchini Spinach and Basil Soup, I tried again and scored!! They were brave enough to try it again and liked it. And as a bonus, this one is much much healthier. In a large pot heat a drizzle of olive oil over medium heat. Add onion and saute about 7-8 minutes, until soft and translucent. Add garlic for another 60 seconds then add zucchini broccoli and saute another couple of minutes. Add broth and bring to a boil. Cover, reduce heat and simmer 8-10 minutes; until veggies are very tender. Remove from heat and add spinach. Stir to wilt. Use an immersion blender to puree soup, or working in batches, puree in blender. Add milk and more broth, if desired. Add salt and pepper, taste for seasoning and adjust as necessary. Top with cheese, if desired, and sourdough croutons. To make croutons, cut about half of the sourdough loaf or boule into 1-inch cubes. Melt 1-2 Tbsp. butter in a large frying pan, add croutons and toss to coat. Season with a few dashes of salt and cracks of black pepper. Saute on medium high heat until they start to turn a light golden brown. So, I was shopping at Costco the other day and this bag of Meyer lemons caught my eye. I've never tried them before although I've been hearing about them for years. Since they were pretty cheap I grabbed a bag and figured I decide later what to do with them. I got a lot of great suggestions from friends, some of which I'll be trying soon, but I also searched the interwebs high and low for something to make that was worthy of my time. Let me tell you friends this lemon cream is it! WOWWY!! No I know that not every loves lemon perhaps as much as I do, but wow, this is just the best. It's not too sweet and has a lovely lemon flavor and luscious creamy texture. You'll seriously want to put it on everything. Try it on pancakes, waffles, crepes, on fruit, over ice cream, the sky is the limit! It only takes about 10 minutes to whip up, so definitely worthy of my time. In a heat proof mixing bowl whisk together sugar, eggs, lemon juice and zest. Make a double boiler by setting the bowl on top of a medium saucepan with a few inches of water in the bottom. Heat over medium high heat. Cook mixture, whisking often, until it starts to thicken and become pudding-like; about 10 minutes. Remove from heat and whisk in butter until melted. Set in an ice bath until cooled then stir in the heavy cream. I know that really the "official" start of winter was only like a month ago but seriously, this winter is already dr...a....g..g....i...n...g! It's been the coldest and snowiest we've had in Utah for a LONG time. Needless to say, I'm always looking for something to warm me up. I walk around the house in warm fluffy socks, slippers and a jacket and always drinking some warm tea. I'm also always looking for warm comfort food to get me through the nights. It's been a while since I've had Olive Garden's Zuppa Toscana. 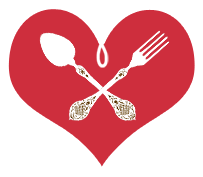 In fact I don't know if I've ever eaten it at the restaurant, my husband and I swore it off years ago. I enjoy the soup but the original is not so calorie friendly, with all the potatoes, pork sausage and heavy cream. I was so happy to find a recipe that is not only much more healthy but exploding with flavor. This soup doesn't miss a beat and satisfies every warm comfort food craving I had. Heat a drizzle of olive oil in a frying pan over medium heat. Remove sausage from casings and add to frying pan along with onions. 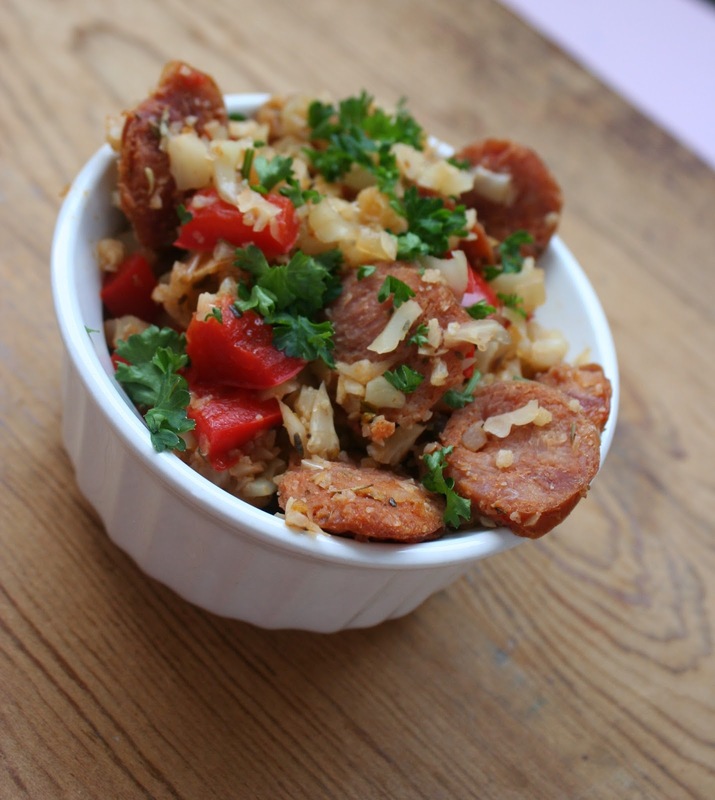 Cook until sausage is no longer raw and both sausage and onions are light golden brown. Toss in the garlic the last 60 seconds. Remove from pan and set aside. Bring chicken stock to a boil in a stock pot, then add cauliflower and potatoes. Cook until tender; about 5-8 minutes. Using a slotted spoon, remove half of the cauliflower and potatoes and puree in a blender with a little stock. Return to pot. Add turkey, onions and garlic back to the pot as well the kale, parmesan, milk and red pepper flakes. Heat through, until the cheese is melted, making sure not to boil. Taste for seasoning then add salt and pepper, to taste. Serve immediately. Nothing says Sunday dinner like pot roast! We don't eat much red meat, and roast maybe once or twice a year. But boy do I love it! And my girls are actually old enough that they are beginning to enjoy it as well. I hadn't had much experience with cooking roast, except in college when I threw it in a crock pot with a can of cream of mushroom soup. Good, but I don't like using canned soups anymore. Luckily many years ago Pioneer Woman came into my life. If anyone knows how to cook beef it's her. So when I first saw her recipe for pot roast I knew it would be good. And she's right, it is perfect!! I absolutely love it this way and don't think I'll change. 1 whole chuck roast, 4-5 lbs. Heat oil in a large pot or dutch oven over medium-high heat. When hot but not smoking, add the onions, browning on each side. Remove to a platter then do the same with the carrots. Generously salt and pepper the roast. Add another drizzle of olive oil to the pot, if necessary, then add the roast. Sear on all sides, about a minute on each, until it's browned all over. Remove to a plate. Deglaze the pan with about a cup of red wine (or red wine vinegar or beef broth), scraping bits off the bottom with a whisk. Place roast back in the pan, arranging the onions around it. (You can add carrots now but I usually add them the last hour.) Add enough broth to cover the meat about half way. Add rosemary and thyme. Cover with lid and roast in the oven 3-4 hours, until fork tender and falling apart. This would be delicious served with mashed potatoes. Use the juices from the roast to make gravy to go with the potatoes. Looking for a fabulous dessert to take to a holiday party this week? Look no further! This Egg Nog Pie will knock the socks off your guests and leave them wanting more. In my family we take egg nog very seriously. In fact my older brother uses the smallest glass possible to drink his egg nog so that the least amount is lost on the sides of the cup. Whatever, I just drink it from the carton, haha! NO really, I do. When I first got married and went to family Christmas parties on my husband's side, they always added sprite to their egg nog. Not this girl, not the watered down version. I like it straight up. So, as you can guess by the number of pie recipes on the blog, I don't do pie much. It's not my favorite dessert, especially the fruit kind. BUT, my husband loves it. I've had several opportunities to go beyond my comfort zone lately and make pie and I think I might be getting into it. At our church Christmas party this year there was a pie bake-off, so I decided to stretch my wings again a little. I usually take this Egg Nog Gingerbread Trifle every year, also amazing, but since it was pie this year, I decided to turn that dessert into THIS pie. You guys, SERIOUSLY. SO. GOOD! And it even won best overall pie. So, don't wonder what dessert to make this week, I've got you covered. Combine gingersap crumbs, sugar and melted butter in a small bowl. Mix until well combined. Firmly press into a 9-inch pie pan. Bake 10 minutes. Cool on the counter. In the mean time, prepare the custard filling. In a medium saucepan, mix together sugar, cornstarch and salt. Whisk in heavy cream, egg yolks and egg nog. Bring mixture to a simmer over medium heat, whisking constantly, until mixture becomes thick and smooth. This may take 5-10 minutes to thicken. The finished texture will be very thick but not gelatinous. Remove from heat and stir in vanilla and rum extracts and butter. Pour custard into pie shell. Cover with plastic wrap, pressing it down against the custard so it doesn't form a skin. Refrigerate pie until it is completely chilled. While pie is chilling, make the raspberry sauce. Combine raspberries and sugar in a small saucepan and heat over medium-high heat 5-10 minutes until is becomes sauce-like. Whisk in cornstarch, making sure there are no lumps, and bring to a boil. Boil about a minute until thickened. Remove from heat and chill in refrigerator. Make whipped cream just before assembling the pie. With electric beaters, beat together mascarpone and powdered sugar. Add whipping cream and vanilla and beat until stiff peaks form. To assemble the pie, spread cooled raspberry sauce over the top. Then, either pipe or spread on the whipped cream. Serve immediately or continue to chill until ready to serve. I don't know what it is about a fresh cinnamon roll that just gets me! That smell has got to be one of the best smells ever. I have to restrain myself every time I walk into IKEA because the smell hits you the second you walk in...and I don't even like their cinnamon rolls! So after the feast that is Thanksgiving, I had NO intentions of making more food, let alone anything sweet. But we had a bunch of mashed potatoes leftover and we just don't eat that much of them. So I decided to make cinnamon rolls! Wait what...mashed potatoes = cinnamon rolls? Yes!! Mashed potatoes is the secret ingredient that makes these super light and fluffy. Add lots of butter and eggs and you've got a deliciously rich brioche-type dough that will melt in your mouth. This recipe comes from a family cookbook, so you know if grandma made it, it's gotta be good. Pour lukewarm milk into the bowl of a stand mixer. Add butter, mashed potatoes, sugar, salt, yeast and eggs. Whisk well until incorporated. Switch to a paddle attachment or dough hook. Add about 4 cups of the flour and mix until incorporated then add 3 more (making 7) and mix again. If dough is extremely sticky, add flour a few tablespoons at a time until it looks right. Dough should be sticky but not so much that you can't handle it. Mix with dough hook for about 5 minutes. Remove dough and place in oiled bowl and let double in size. Punch dough down and divide in half. Roll one half at a time into a long rectangle. Use your fingers to "SHMEAR" on half of the softened butter all over the top. Sprinkle on half of the brown sugar and gently pat down with your hand, then half of the cinnamon. (I tend to be heavy handed with the cinnamon so go light at first if you'd like.) Roll it away from you, stopping with about an inch left on top. Pull that part towards you, pinching it down. Use unflavored dental floss and pinch off rolls, about 1-1/2 inches thick. Place in greased cookie sheet or round cake or pie pans. Repeat with other half of ingredients. Let rise again until rolls fill out the pan. Once rolls have risen, preheat oven to 350 degrees F and bake for about 15-17 minutes or until golden brown on top. Allow to cool until just barely warm to the touch. Glaze and cool completely. For the glaze: Mix together softened butter, powdered sugar, and vanilla. Add milk a tablespoon at a time until you've reached desired consistency. Whisk glaze until smooth. Spoon about a tablespoon on each roll and spread around covering any exposed surface. **NOTES: This makes about 2 cookie sheets worth of rolls, a lot! I love to make these in those disposable foil tins, they are kind of like pie tins but they have straight sides instead of slanted. You can find them pretty much anywhere, they're super cheap. I also like to make them in the tins because I can just give a whole pan away and not worry about getting it back. Great for neighbor gifts. You can also freeze them after the first rise, when you cut them into rolls and put them in the pans. It'll just take longer to thaw and rise all the way. Mmmm, fall is in the air. I'm extatic! Time to start baking everything with pumpkin, drinking hot chocolate every night and making gobs of soup! I LOVE soup. My kids pretty much only like the homemade tomato or taco soup variety but we may have to do something about that soon. Pozole, also spelled Posole, is right up there as one of my favorite soups. This is my third and definitely my favorite posole on the blog (see here and here for the others). 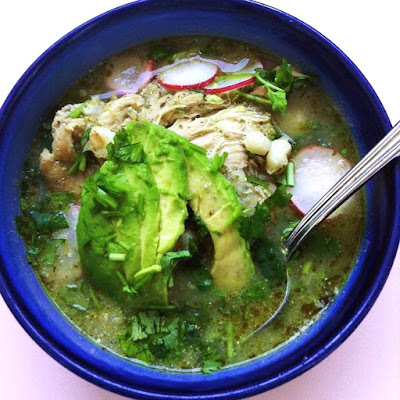 Pozole is a traditional Mexican soup using a rich brothy base with meat, usually pork or chicken, garnishes such as cabbage, salsa, lemon or lime, and it's staple: maize, or hominy. There is also the red variety made with tomatoes and the green variety, made with tomatillos and peppers. If you can't tell by the color, this posole is verde! This soup gets it's start by roasting the vegetables, giving it that little bit of smokiness. Then while it's simmering away with the broth and chicken, you can prep your garnishes. The garnishes are almost my favorite part, they really brighten up the soup and give it a fresh element that is not only eye appealing but mouth appealing too! *Note: I used bone-in, skin-on chicken thighs, just removed the skin before cooking. Either way works fine. Preheat oven to 500 degrees F. Place tomatillos, garlic, onion and jalapeno on a baking sheet and drizzle with olive oil. Sprinkle with salt and pepper and toss with your fingers. Bake about 15 minutes or until veggies begin to char. While veggies are roasting, toast the cumin seeds in a small frying pan over medium-high heat until they become fragrant; 2-3 minutes. Grind pepitas and cumin seeds in a spice grinder until finely ground, set aside. Drizzle olive oil in the bottom of a dutch oven and heat over medium high heat. Add chicken and cook a minute or two on each side then remove and set aside on a plate. Once veggies are done roasting, cool slightly and slide everything into a blender jar. Add half the cilantro, the salt and blend until desired consistency. Add another little drizzle of olive oil to the dutch oven then pour in the contents of the blender. Bring to a simmer, stirring frequently and scraping off the brown bits from the bottom. Add chicken broth, ground pepitas and cumin, oregano and hominy. Stir to combine. Gently place the chicken thighs in the pot and simmer, uncovered, about 20 minutes. Taste for seasonings and adjust as necessary. It's that time of year. Summer is winding down and the garden is bounteous. Most years I have a good tomato crop but this year seems to be a difficult year. I have lots of plants but my tomatoes aren't turning green!! Fresh tomatoes are my favorite part of summer and having a garden. I hope they start turning quickly before the weather does. Typically around here, they're done the first week of October so that doesn't give us very long. Lucky for me, there are several produce stands around here that sell local tomatoes by the box. I usually hit them up once or twice a season so I have enough to put up for the winter and through next year. We love to can spaghetti sauce and tomatoes for soup and, of course salsa!! It's been a few years since I canned salsa and we are sorely missing it!! I found this Restaurant Style Salsa to hold us over in the mean time, but there's nothing like the taste of salsa made from home grown tomatoes. This roasted variety will blow your socks off (especially if you use a lot of chipotles!!). I love the smokiness of the roasted tomatoes and chipotles, it's seriously the best-tasting salsa that's come out of this kitchen in a LONG time! Rinse tomatoes, slice off top and cut in half. Place cut side down on a baking sheet and place under broiler. Broil until tomatoes start to blacken. Remove from oven and slightly cool. Add all ingredients into a blender and enough chipotles to suit your taste. Blend to desired consistency. Taste and adjust seasoning as necessary. Store in airtight container in the fridge or process in boiling water bath canner for 15 minutes. **If you are not planning on canning the salsa you can omit the vinegar and reduce the lime juice to 1-2 tablespoons. Melt butter and set aside to cool slightly. Preheat waffle iron. In a large mixing bowl, whisk together buttermilk, pumpkin, vanilla, sugar and egg yolks. Slowly whisk in melted butter. In a separate bowl, stir together the remaining dry ingredients then gently stir them in with the wet ingredients until just incorporated. In a separate mixing bowl, beat egg whites until stiff peaks form. With a spatula, gently fold them into the batter until almost incorporated, add the chocolate chips then fold in a few more times. NOTE: Egg whites do not have to be completely incorporated, just mostly. Pour batter onto waffle iron and cook according to manufacturer's directions. Serve with choice of toppings: pumpkin maple syrup, syrup, cinnamon sugar, or powdered sugar. I know it's nearing the end of the summer but we have been enjoying this yummy breakfast for a couple months now so I wanted to share. My friend made me something similar when the girls and I had a sleepover with her and her kids and I haven't been able to stop making it since. Even my three-year-old loves it and asks me to make it for her frequently. She even loves to run outside and pick some fresh basil and tomatoes for it. I love quick and easy breakfasts that are also healthy and fresh. This egg scramble is easily customizable to suit your own tastes, what you have in your fridge or even your garden! Enjoy. Crack the eggs into a bowl and whisk. Set aside. Heat a drizzle of olive oil over medium high heat in a frying pan, saute the ham until it just starts to brown. Add the garlic for another 30 seconds. Add eggs and tomatoes scramble about 2 minutes. Remove from heat while they are sill a little glossy and toss in the basil and cheese. Stir just to combine and allow to sit for a minute or so, so the cheese can melt. Slide onto two plates and garnish with extra basil and tomatoes, if desired. School is right around the corner, in fact just one week away for us! We are on A Track this year, meaning I need to get my kids up, ready and fed before 8am!! Wow, considering they've been staying up until 10pm, waking up at 9am and not eating breakfast until 10am sometimes, this is going to be quite an undertaking. I don't do cold cereal, mostly hot breakfasts and sometimes they take longer than 5 minutes. I'm going to have to make sure I plan ahead, which is why I LOVE baked oatmeal. My girls and I enjoy oatmeal in it's many forms, but baked is our favorite. It's so versatile too. Sometimes I like to add berries or mashed bananas to change up the flavor, or even throw some chocolate chips on top while it's warm. Adding peanut butter this time was genius though!! To say we loved it is an understatement. I baked this ahead in a big pan (doubling works wonders and keeps well too) and we ate it two days in a row. Talk about a time saver! This will definitely be a keeper and something I can make ahead and pull out quickly on those early school mornings. Preheat oven to 350 degrees F. Grease an 8 or 9 inch baking pan. In a mixing bowl combine egg, brown sugar, applesauce and peanut butter and whisk until peanut butter is well incorporated and there are not lumps. Add in vanilla, salt, baking powder, cinnamon and milk and whisk to combine. Stir in the oats then pour into prepared baking pan. Bake in preheated oven 35 minutes or until lightly golden on top. Serve warm with a splash of milk, fresh fruit, nuts or even a few chocolate chips. I had no idea what Jambalaya was until my parents moved to Georgia when I went to college. It's a southern dish that's typically a mash-up of rice, meat (chicken, andouille sausage and shrimp), veggies, spices and chicken stock. It's kind of like a Spanish paella, only southern-style. While living in Georgia my mom got this recipe from a friend for Quick Chicken Jambalaya. It was my first and pretty much only experience with jambalaya and we made it and loved it for years. It's super easy and yummy and not too spicy. After getting into cooking more and wanting to branch out I started looking for jambalaya recipes that were a little more authentic. My sister pointed me in the direction of this recipe and we have really loved it. It's so full of flavor and just the right level of heat for my taste (although may be a little spicy for the kiddos). It's also great because once everything is chopped and ready to go, you can throw it together in a jiffy! Heat a drizzle of oil in a large sauté pan over medium-high heat. Add celery, onion and peppers and sauté about 4 minutes. Add garlic and sauté another minute. Add another drizzle of olive oil, of necessary, and add chicken to the pan. Sauté a couple minutes until about half-cooked. Add the sausage, tomatoes, rice, stock, Creole seasoning, bay leaf, thyme and cayenne. Stir together and bring to a boil. Reduce heat and, cover, and simmer for 20-25 minutes, or until rice is cooked. Once rice is tender stir in the shrimp to combine. Continue to simmer until shrimp is fully cooked. Remove from heat. Remove bay leaf and check for seasoning. Add more Creole seasoning, salt and pepper, as desired. Serve warm with choice of garnish. **Note: I halved the original recipe because I didn't think my kids would eat it and I didn't want to have tons of leftovers. To make original recipe, double everything except the chicken stock and tomatoes. Still use 1 can of tomatoes and use 3 cups chicken stock. Confession: I don't think I've ever even had a jalapeño popper! I don't even know what they really taste like but I could not stop thinking about the idea of this pizza. So mouth-watering, I had to make it. Like over and over. My husband's response to what kind of pizza we were having the other night when I made this was, "oh, that one again." Yeah, that one again. Don't get me wrong, he loved it too. The first two times I made it there was no chance of getting a picture so I had to make it again to make sure I got it just right and had a quick couple of seconds to snap some pics. This pizza definitely isn't the hottest thing I've tasted, but just enough heat and smoke for my taste. I used half pepper jack cheese and half smoked cheddar cheese (my fave). Smoked cheddar (not the processed smoked cheese "product", but real cheese) might be hard to find in some areas, so using all pepper jack or using mozzarella or sharp cheddar would be a good substitute. Sometimes I like to add grilled chicken but it can get heavy. In that case, I would use parchment to roll the dough on and just slide that onto the pizza stone. I also brush the edges of the dough with some of the bacon fat and that's TOTALLY optional, but not really....just do it. Prepare pizza dough as directed. While dough is rising, cook bacon and set aside, reserving a couple tablespoons of the bacon grease. Prepare the rest of the ingredients. Preheat oven and pizza stone to 450 degrees. Stretch out pizza dough onto pizza peel dusted with flour or cornmeal. Brush bacon grease around the outer edges. Using either your fingers or a spatula, spread softened cream cheese over the dough, leaving about a 1-inch border where you brushed the bacon grease. Layer both cheeses, crumbled bacon, red onion and jalapeños. Slide pizza onto baking stone and bake 8-10 minutes, or until lightly golden and cheese is bubbly. I know it's summer time and hot, hot, hot! But my oldest daughter has fallen in love with chili since eating it at a friend's house recently. I don't know about you, but I'm so over the dinner time struggle!! I know I still have to deal with it for years to come, but hey, if I can find a few more healthy things my kids like that I can add in to the dinner rotation, I'm all over it. My middle daughter already LOVES this black bean soup, as well as taco soup, so I didn't think it would be hard to get her to try this delicious chili! Plus, you can totally eat it with chips. That always gets their attention, haha! To my surprise both girls told me they didn't like the chili, they LOVED it! I was so happy, I literally jumped up and down with them. Dinner time was happy time that night. This chili, like most soups, is open to a little interpretation. I didn't add a ton of heat because I knew my three littles would be eating most of it. I wanted to add a couple chipotles in adobo during cooking but I knew it would be too spicy, but feel free to do so. Instead, I decided to just use the chipotle tabasco sauce on the side instead; my husband loves that stuff anyway and puts it on everything. Whatever you do, don't leave out the smoked paprika, ginger ale and cocoa powder!! They lend such a unique element to the dish, I think that's why I loved it so much. This chili would be lovely served with some cornbread, fresh tortillas or even hot cooked rice. Heat olive oil in a large sauce pan or Dutch oven over medium high heat. Add onion and ground beef and cook until onions are translucent and beef is browned. Drain off all but a tablespoon or two of the fat. Add chopped red pepper, garlic, salt, pepper, chili powder, cumin, cocoa powder, oregano, smoked paprika, and brown sugar. Sauté 2-3 minutes, until fragrant. Add ginger ale, tomato sauce, black beans, RoTel and tomatoes to the Dutch oven. Stir to combine. Bring to a boil, then reduce heat to a simmer, cover and cook about 15-20 minutes. Serve warm, with desired garnishes. Right before my birthday this year I posted on facebook a couple of times that I was getting ready to choose my birthday cake. Usually it takes about a month (the time frame between my husband's birthday and mine) to decide but this year seemed busier than usual and my birthday was getting closer and I still didn't have a cake picked out. SO, a week or two before my birthday hubby and I were out to a play and waiting for it to start so I whip out my phone and we scroll through alllllllll the cakes I have pinned (seriously there's a ton!). When I saw this one, at the very end mind you, I knew it was the one. I LOVE anything s'mores and this cake looked just absolutely delicious. Plus, it's from Smitten Kitchen, so I knew I couldn't go wrong. I was so, so happy with this cake! Luckily I was able to share with a bunch of people, otherwise I would have been in BIG trouble. I love how the cake tastes exactly like graham crackers and the ganache practically melts in your mouth, like it had been melted by the campfire. I go for a classic s'more and to me that's only with milk chocolate, which it weird because otherwise I pretty much only like dark. I really like the taste of Hershey's milk chocolate, that's what I always use when making s'mores. Feel free to use something different but whichever chocolate you choose, make sure it's good quality. Since the ganache is basically only cream and chocolate the flavor really counts. Preheat oven to 350 degrees F. Grease 2 9-inch round cake pans, line with parchment paper, then grease the top of the parchment. Set aside. In a mixing bowl, whisk together flour, graham cracker crumbs, baking soda and powder, salt and cinnamon. In the bowl of a stand mixer, beat together butter and sugars until they are light and fluffy; about 2-3 minutes. Add eggs, one at a time, beating after each addition. Add the flour mixture alternating with the buttermilk, in three additions. Scrape down the sides and mix until just combined. Divide the batter between the two cake pans and bake about 30-35 minutes, or until a toothpick inserted in center comes out clean. Cool in pans about 10 minutes then remove from pans and cool completely on a wire rack. Wrap each cake in plastic wrap and chill in refrigerator at least 30 minutes (I typically refrigerate overnight.) *NOTE: This cake is very soft and tender, especially when it's still a little warm. When lifting and wrapping the cake be very careful so it doesn't break. To make the ganache place the heavy cream and salt in a sauce pan and barely bring to a simmer over medium heat. Add the chocolate chips, cover and remove from heat. Let sit 5 minutes. After 5 minutes, remove lid and whisk until chocolate is completely incorporated and mixture is smooth and sheen. Transfer to a bowl and refrigerate until firm enough to spread on the cake. To make the meringue frosting, place the egg whites, cream of tartar and sugar in a heat proof bowl. Place over a simmering pot of water and whisk constantly for about 3 minutes, until sugar is dissolved and it's warm to the touch. Transfer to the bowl of a stand mixer with a whisk attachment, or use electric beaters. Beat until stiff glossy peaks form, 4-7 minutes then add vanilla and mix in. To assemble the cake, remove from the fridge and unwrap. Using a long serrated knife carefully slice each cake in half. Place the bottom half of one cake on cake plate. Spread with about 1/3 of the ganache. Place top half on top of the ganache and then spread another 1/3 of the ganache over that. Place the top half of the second cake top down over the second layer of ganache. Spread with remaining ganache and place the bottom half of the second cake, bottom up, on the very top. Quickly do a crumb coat with the meringue and place in the fridge about 10-15 minutes to let it set a bit. Bring it back out and generously frost the cake, with extra marshmallows for garnish, as desired. Brown with a kitchen torch. Keep leftovers covered and refrigerated. Hello to the most amazing creation ever made!! No seriously this is NO joke. When it comes to cookies I'm a die-hard chocolate chip cookie lover, homemade of course, and fresh out of the oven. I like other cookies too, but I'm picky. So, when I tried a cookie similar to this at a local restaurant I was seriously blown away. I had never tried anything like it. The flavor combination is out of this world! And totally genius, if you ask me. The cinnamon-y and slightly salty cookie with the sweetness of the marshmallow buttercream. OH. MY. So, without further ado, I give you the Snickerdoodle Sandwich cookie with Marshmallow Buttercream Filling. In the bowl of a stand mixer, beat butter and sugars until light and fluffy, about 2-3 minutes. Add in egg, yolk and vanilla and beat for another minute, scraping down the sides as necessary. In a separate bowl, sift together baking soda, cream of tartar, salt, cinnamon and flour. Gradually add it to the butter and sugar and beat until well incorporated. Mix the cinnamon sugar in a small bowl. Using a small cookie scoop or a spoon, scoop out dough and roll into a ball, about 1-inch. Roll the tops of each dough ball in the cinnamon sugar mixture then place them on a cookie sheet, about 9 to a pan. Do not over crowd. Bake about 10-12 minutes, turning cookie sheet halfway through baking. Try not to underbake them, as you will need them to be sturdy while spreading the frosting. Cool cookies completely on a wire rack. You can even place them in the fridge so they are more firm.